It’s time for another lap around our INSIDE TRACK! With each of the posts in this series we’re deep diving into a particular topic that touches various sectors of our industry. From Creative Directors to Production Producers and every role in between, we aim to provide you with a regular helpful cheat sheet with all of our findings. This month’s primer is all about music, and specifically about the language we use to talk about it. Music is a universal human language. However for any of us to be discuss or describe it it’s necessary to utilise words. 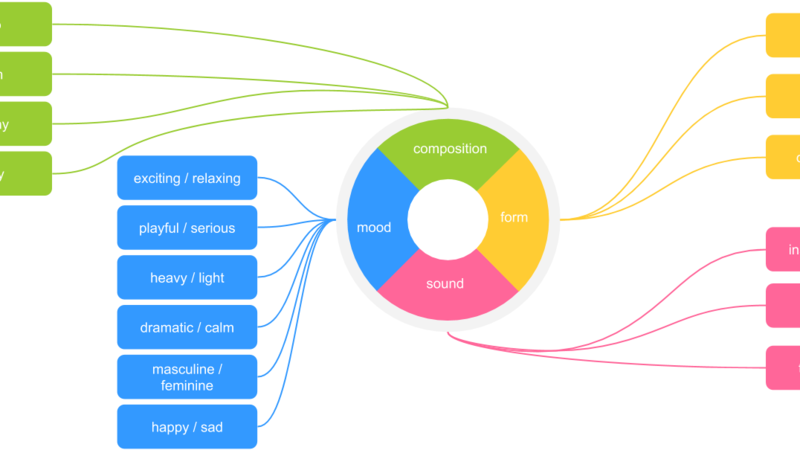 Finding the right words to describe music is not always an easy task, especially when those words are need to translate abstract ideas, emotions and indirect imagery. For creatives in particular, communicating specific and internal often presents a vocabularic challenge. When commissioning music pieces, how do you steer the musician towards an effect which you perceive internally? Which words most clearly communicate your message? You will find that applying a structured vocabularic approach to your music briefings helps improve the clarity of your communication, and in turn the quality of compositions submitted. The vocabulary and structure of the four distinct criteria detailed below – Form, Composition, Sound and Mood – will help you communicate all the nuance and complexity that your music brief deserves. LENGTH: It is advisable to specify the maximum length of longest version of the song, as creating a shorter version is generally an easier task than extending a piece that is too short. STRUCTURE: There are no limitations here, but this presents an opportunity to specify if a piece of music should be one long development, if it should follow a chorus / verse / bridge format, or if it ought to include other individual parts. DEVELOPMENT: What are the arcs of the composition? How should it build towards a climax? At what moment does the music need to develop or reduce its intensity? This is all about which transitions are needed for specific cues within a certain timeframe. FLOW: As rhythmic structure requires a grid (time signature) and tempo, transitions must occur within this grid. The flow of the music should create transitions that feel natural and complementary. TEMPO: BPM is the number that indicates Beats Per Minute, and this number will rarely, if ever, change throughout the course of a song. Briefing notes will sometimes request that a song become faster or slower at a certain point. It is a common misconception that to achieve this effect the BPM should be increased or decreased. Most likely, these requests to speed up or slow down will relate to a song’s tempo – for example, a half, or quarter, or double tempo. HARMONY: It may tempting to characterise music in simplistic terms such as happy, sad or emotional. Alternatively, try to explain the nature of the harmonic structure with more detailed descriptive terms, such as monotonic or rich, simple or complex, major or minor, tonal or atonal. Additionally, assess whether important harmonic progressions are needed to achieve a certain goal, or if the main function of the harmony is to support the melody. MELODY: There are many words that could be used to describe melody, for example a phrase like ‘A catchy, singable melody’ is already revealing. Similarly, words like staccato (detached notes), legato (connected notes), improvised, predictable, melancholic, uplifting are suggestive and illustrative. Please note: when referring to the sound of a recording it is common to refer to high or low frequencies; whereas when giving comment on the melody of the composition, we will instead refer to high or low notes. INSTRUMENTATION: There are two levels of instrument groups: collectives such as orchestras, ensembles or choirs, and single instruments like oboe, guitar or synthesizer. When referring to instrument sounds, be sure to be specific about the separate guitar sounds (bass, electric or acoustic), and try to differentiate a drumkit from percussion elements (like shakers, bongos, tambourine, etc.). Referencing synthesized instruments can be more difficult as new sounds are developed every day. Nevertheless you can still use language to describe the length, rhythm and temperature of a synth sound. DYNAMICS: This refers to the variation in loudness of a sound. Within a single composition, orchestral instruments tend to have a high dynamic range (from very quiet to very loud), whereas EDM music generally does not have this big dynamic range. The loudness range of classical instruments is often indicated by the terms pianissimo, piano, mezzo forte, forte, and fortissimo. The terms that is used to describe the increase in dynamic needs is crescendo (quiet to loud), while decrescendo describes the opposite (loud to quiet). Velocity refers to how powerfully an instrument is played, for example a soft drum sound can still be played back very loudly, but it differs in sound when it is hit hard and played back quietly. TEMPERATURE: These adjectives are probably the most vague descriptive parameters, but also the most interesting. For example: a warm or cold, noisy or clean, acoustic or electronic, dark, mellow, muddy or bright, pure, clean, or vibrant, harsh, rough, shrill, piercing, dull or muffled sound helps to describe the timbre and texture of the music. MOOD PROJECTION: A mood is a cluster of feelings which are an integral part of the human experience. We can also apply our internal experience of moods to help describe the experience of music. Music induces feelings that are intentionally directed back towards music, so that even sad music can elicit pleasure and comfort in listeners. Since moods create bias, moods have the ability to affect, for instance, the way we perceive the world around us. If we are in a happy mood, we are more inclined to perceive the faces of people around us to be happy. MOOD INDUCTION: This is a process whereby an emotion is induced because the listener perceives the emotional expression of the music, and “mimics” this expression internally by means of either peripheral feedback from muscles, or a more direct activation of the relevant emotional representations in the brain. This leads to an induction of the same emotion, so transformative internal language would be appropriate in this case.